Cozy cabin with a nice view of Lake Superior. Get away from it all on a peaceful plot of land just a short stroll from Lake Superior. This adorable new cabin in Schroeder has a great hill top view of the lake. Access to the cobblestone shore of the lake is just a short walk down the hill on the gravel drive. So while not directly on Lake Superior, you are nestled amongst the trees in a quiet, peaceful setting. 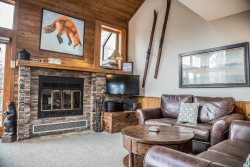 A great rental in combination with Superior Reflections 1 and 2, both of those just steps from the beach, so the whole group can come and enjoy the beautiful north woods. If your goal is to just sit back and relax, that's easy to do here, as well! Sit on the picnic bench with a good book or walk down to the shared shoreline and skip rocks on the cobblestone beach. Whatever your vacation goals are, the cozy Superior Reflections 3 has a lot to offer. Great customer service, information received ahead of time was very helpful. This cabin was just the getaway my hubby and I were looking for. It was so peaceful, loved the view!!! And easy to find with the directions provided. Nice small cabin - clean and nicely remodeled. Most of the windows have been replaced and work great the old ones also work. Beach is very close and beautiful! Location is great! Close to lots of beautiful hiking trails and Grand Marais. Very pleased to see the drinking water cooler since the water up there is pretty bad tasting. Had a great time! The contact we had with the team was great. The cabin was great! Perfect location, very clean and cozy. I booked off of cascade website. Great website and easy reservation process. We enjoyed our stay at this cute cabin. Very clean, comfortable beds, nice linens and well stocked kitchen. Also liked the water cooler. Great location to many activities and a short walk to the lake. Superior reflections number 3 is exactly what we were hoping for! It was perfect for a few days away from the city with my best friend. Very nice cabin. Our only issue was the quality of the water. It was so hard that soap and shampoo would not lather at all. A water softener would have been nice. This was a great place to stay. It was very clean and up to date. They provided many of the basic household amenities and a grill. It was unusually hot during our stay and they provided us with a box fan to help cool the cabin. The cabin is conveniently located close to the beach and easy access to swimming and beach fires. It is close to many of the state parks, Lutsen, and Grand Marais. We loved our stay and would definitely stay here again. Cabin is in great condition and very clean. We made good use of the kitchen since there are a limited number of nearby restaurants (picky eaters). We appreciated the small fans in each bedroom as it was a warm weekend on the North Shore! 2 of the 3 guests were not comfortable going "through" other guests yards in order to get to the nice pebble beach so that was a disappointment overall. Perhaps some welcoming signage for Reflections guests would have helped with that. Menus from nearby restaurants and directions (for newby North Shore travelers) would also be a nice touch.